There are lots of different events that runners can do, short distances and long distances and even ultra long distances. I do not think I will ever try one of these ultra distances but I have learned enough to never say NEVER! We have a friend training to run a 100 mile event at the end of May and I have been in awe of her training, she is a machine. Most days she has 2 or 3 workouts and on the weekend she runs crazy long distances. These runs are so long that she recruits friends to run portions of it with her to have company for the 6 or so hours she is out there. She always has lot of people willing to run with her but I have never stepped up since I am considerable slower. Not that other runners care but I hate to slow people down as I run when they are faster. This is a "me" problem, not a "them" problem since I have never had anyone complain about me slowing them down. Last night I got my chance to run with her, I had the 12am to whenever shift. Her 65k run started at 8pm and would last as long a necessary. I only had 10K on my schedule but I would do what I could to help out. I had finished a race before in the middle of the night (Disney Wine & Dine) but never started one in the middle of the night before, something else to check of the list of awesome things done. There was a gorgeous almost full moon out when we arrived at the parking lot at 12am. My hubby and hers were riding along with us for company and we did not have long to wait before she and the 10-12 shift arrived (like I said she always had people willing to run with her). I managed almost 13K and I did not slow her down too much (I think) and I had a fun abet chilly run. Instead of iPod music we were serenaded by frogs and crickets and the occasion slap of a beaver tail....and my heavy breathing. It felt to me like I was running faster then the Garmin said and at one point I started to struggle but I dug deep and said keep on moving, don't give in...and I didn't. So maybe a 13K race pace run was not on the taper schedule for today but I am sure glad I finally had the chance to run with my friend and do my small part in her training odyssey. If you have followed my blog for a while, you may remember I wrote about this friend before and what and inspiration she is to me and she continues to be. There are not a lot of people I would go running with at 12am in the morning but she is one of them and given the list of people willing to run crazy distances with her, I am not the only one who feels this way. One week until my next half marathon in Toronto and I am ready, well as ready as I will ever be. This race is not about me, it is about running for all the people I know and love with Diabetes. I will also run as a dedication to those who died or were injured in Boston, for those runners who finished the race and especially for those who did not get the chance. 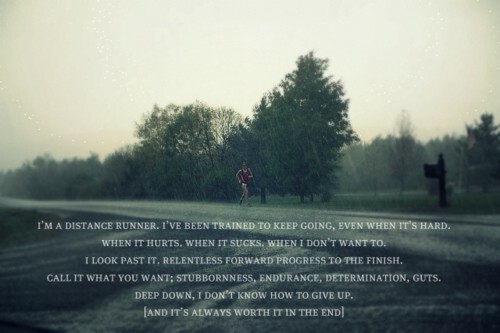 The running family is a tight one, especially here where I live so Sylvie and Terri, this one is especially for you.